“What a read! Nothing in the world will prepare you for your journey of removing the layers within you to emerge or re-emerge the powerful spark of being a woman and understanding your true nature." Ecstasy is more than just a drug. Coach and Author, Merav Richter, defines it as a way of being which is achieved as women begin to step into their greatest power, presence, and possibility. Her new book, “Brave Ecstatic Woman”, is a guide drawing upon ancient and modern-day philosophy, mysticism, spirituality and scientific research to help women step into their authentic, feminine power and experience ecstasy in their everyday lives. Richter was inspired to ignite her own feminine essence after feeling unfulfilled in a life that seemingly offered her everything she wanted and needed. For over 25 years, she worked to identify the key to bringing freedom and ecstasy into everyday life and uses her book and platform to show women everywhere that living a brave, ecstatic life comes from within. “What a read! Nothing in the world will prepare you for your journey of removing the layers within you to emerge or re-emerge the powerful spark of being a woman and understanding your true nature,” a reviewer wrote about the book. 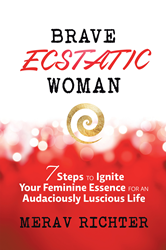 Women of all ages will enjoy “Brave Ecstatic Woman” and the tools within which will help them amplify their authentic nature to live ecstatically every day. Merav Richter is a philosopher, poet, performer and peacemaker. She is the founder of Ecstatic Movement, a technique dedicated to energetic transformation, empowerment and esoteric wisdom. She is the author The Secret of the Storyteller, a novel of awakening. Merav holds a degree in Philosophy of Religion and has studied the mystical traditions extensively. She is committed to supporting women to create the bravest, most ecstatic version of their lives. She teaches and speaks about women’s mysticism and empowerment. See http://www.MeravRichter.com for information on courses and events. To learn more, please visit http://www.meravrichter.com.